I know I should have started using moisturiser daily a long time ago, but I didn’t. So when I realised I probably needed to, I spent ages researching the best one and this Clarins cream has won a gazillion beauty awards so it seemed like a safe bet. And let me tell you, this baby isn’t going to be upgraded any time soon. It’s the perfect moisturiser for all skin tones, it’s not oily or greasy and one pot lasts ages too so it’s worth the money. My skin feels soft, healthy and generally well looked after when I’ve applied it, and it adds a really nice energised glow too. I’m a big Clarins fan, and this doesn’t disappoint. I get quite dry skin on my hands and elbows etc, especially during the winter, so it’s really important to me that I’ve got a good body lotion. I absolutely HATE the feeling of wearing any type of cream or lotion on my body, especially as I’m usually applying it before getting dressed (either for work or for bed.) So this means I have a love/hate relationship with body creams – it’s not like I have so much time to spare that I can stand around naked for 20 minutes waiting for it to dry, while pacing the house in some sort of bear-like position is it?! So the saving grace for this one is that I adore the smell and it just about makes up for the fact that I hate the feeling of my clothes on wet, moisturised skin (ewww). It smells like luxury soap and water, so it’s got a really clean and light scent that’s easy to wear but doesn’t interfere with your perfume. It’s really delicate and this bottle has lasted me well over a year, as you barely need any because a little goes a long way. It’s quite pricey at £29 but it’s worth the splurge for the scent and ease of application. My Polycystic Ovary Syndrome and Endometriosis means that my skin can be prone to break outs – especially when I’m stressed too. Everyone tells me they can’t even tell when this happens, but I know it’s there and it makes me feel so self conscious, which is one reason that I’ve tried every product under the sun to help get the break outs under control. Over the years I’ve tried everything from cheap and cheerful home remedies, oils and creams right up to painstakingly expensive treatments. The best I’ve found is the Dermalogica MediBac Clearing products – and I’ve not even considered trying anything else since I started using these products a few years ago. If you buy all the full size products individually then you’re looking at spending at least a couple of hundreds of pounds. So I just buy the kit which costs £44 and contains travel/mini size products of the best bits of the entire range. Because my break outs don’t happen all the time, I don’t need to use these daily – but they are always there when I need them – which is why I can get away with the smaller kit. Now I know how well they work, if a break out did drag on for ages, I would absolutely bite the bullet and purchase the full size products though. I’ve never actually found a product that overnight ACTUALLY gets rid of break outs, but these products significantly reduce the effects within hours. If you get break outs then I highly recommend the Overnight clearing Gel (you’re not going to find anything that will take your spot/pimple down as much as this) and the Sebum Clearing Masque which is great for clearing pore congestion. I literally swear by this range. You’ll remember that I did a whole post on the Cocoa Brown tan products last year (read it here). Over the years I think I’ve tried almost every tan product on the market – nothing has worked for me like this does. The 2 in 1 Night & Day tan is the perfect tanning product for me as it gives an instant colour when I’ve not had time to forward plan a tanning regime over the previous nights in preparation. But it also acts as a gradual tanner too, so I can catch up with my preferred colour while already looking tanned – win/win. This has pride of place on the tanning corner of my beauty shelf. My first ever Depop purchase, I’ve never been one for lip balms before but had heard all about EOS and decided to splurge. I’m used to spending £1 on a pot of vaseline when my lips need a bit of TLC so spending £6 or so on something with the same (actually less) amount of product was a bit weird to me. But I bought it, and I’m so glad that I did. I’ve got the coconut milk flavour one and it smells divine, but also really moisturises my lips. It’s so thick and creamy when applied that it’s like having an intensive lip treatment on – and the knowledge that it’s an organic product means I feel like I’m doing something nice for my lips – a part of my beauty routine that I usually forget about. I’m a waxer, but you always need a good pair of tweezers for eyebrow stragglers etc. These came in last months Glossybox which was perfect timing as my old ones were so weakened in the mechanism that they were almost useless. These are perfect – slanted, tight and easy to hold they make sure that keeping on top of my brows is an easy job. I can’t recommend this product enough if you have fine hair, or hair that lacks volume. This is amazing and one of the few products I’ve tried that actually does give full volume… So many hair products are designed to give amazing volume (think hot air balloon) and yet so many fall short of the mark, especially when you have thin and fine hair like mine. This however worked the first time I used it. My hair had never felt so soft or smooth and it was so shiny afterwards too. The natural lift and bounce was fantastic after only one use as well. However, sadly it’s an intensive treatment, not something you can use every day (hence why it’s on my bathroom shelf and not in my shower!) When I tried to use it more than once a week, I found it didn’t have the volumising affect, so for now I’m happy to use it as a hair treatment once a week or so. This also came from my Glossybox and it’s one product that I will 100% be purchasing when it runs out. Yes, it’s a mens scent. But I love it and it’s my quick and easy go-to spray right now for when I’m at home! I bought it at Christmas when I spent ages trying out the Tom Ford perfumes and nothing smelt quite as nice as this one. It’s not a heavy scent, so I don’t walk around feeling like I’m wearing mens aftershave and so many people compliment me on my ‘perfume’ when I’m wearing this…teehee. I don’t wear it every day, more like just as a fresh spritz when I’m feeling the whole light make-up, hair up, kinda vibe, as it’s very light and delicate. Personally speaking, I think it’s better for women anyway, but hey I would say that as I wear it! 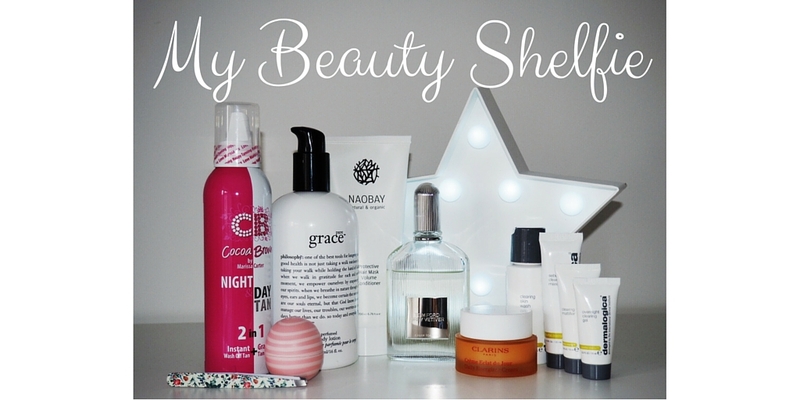 So that’s my Beauty Shelfie, inspired by Glossybox because I absolutely love reading their monthly Beauty Shelfie posts (check them out here). What’s on your beauty shelf?